This month we have award-winning author Corine Fenton. Here's her launch speech about researching My Friend Tertius. This story has been the biggest struggle. I thought Queenie took a long time at almost five years. Tertius has taken a decade. But now I can say, without any doubt, that every bit of research, every word changed, moved, altered and agonised over, has truly been worth it. For a story, which from the beginning seemingly told itself, its format as a picture book was like writing a door-stopper and then choosing one word from each of the 3,000 pages and cobbling those one-words together. And they had to be exactly the right words. From the moment I heard about Tertius, then discovered his connection with Arthur Cooper, I couldn’t let either of them go. I knew their story was a wonderful, exciting, marvelous adventure, but more than that, it is a love story. A tale of caring and dedication, of making allowances and sacrifices and risking everything for something you love. To be honest, I hadn’t planned to write about a man and a gibbon at all. To follow Queenie: One Elephant’s Story, I wanted to write a story about all the colourful animals who have resided at the Melbourne Zoo – a snippet of the ones with character. But before I got anywhere with that, I heard about Tertius, a gibbon who had once lived at the Melbourne Zoo. But Tertius was different, he sipped orange juice with a straw, enjoyed a real cup of tea morning and night and slept in the zoo director’s house in a basket. From newspaper articles and zoo records, I learned he’d had another life before the zoo, so I started working backwards. I found articles which suggested he’d come from the port of Fremantle. I happened to be at a writer’s festival in Fremantle at just the right time, so I checked through Customs and police records for 1942, with fellow writer Karen Tayleur beside me, and we drew a blank. 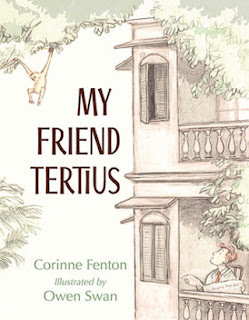 Tertius was an unusual name, particularly for a gibbon, so I wondered where that came from. I Googled and one day found a short reference to a gibbon called Tertius in books written by an American author & journalist, an adventurous soul who I think was born way before her time, called Emily Hahn. Eventually I found Emily Hahn’s daughter who pointed me to the Lilly Library in US which housed her mother’s collection of writings and amongst it I found a letter that Arthur Cooper had written to her in 1973 – with the most precious photos of Arthur Cooper and Tertius. That was like finding gold. Research for this story was truly like hunting for pieces of a jigsaw. A very large jigsaw. 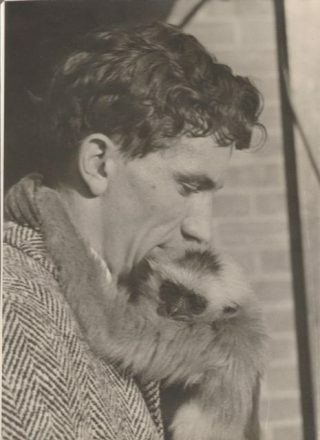 In a time and a place when it was quite acceptable to carry an exotic animal into bars, to drive about in cars and visit famous restaurants, Arthur Cooper saved a little Gibbon and showed him a different existence. Arthur Cooper cared for him and loved him.